First in Capri 110, a great winter get away. Quiet and secured. Very helpful and accommodating staff. As our stay was ending, blizzards hit our home area making it impossible for us to travel. Our time in #110 expired. The staff quickly found us another condo. Capri 120 was the beginning of emergencies for my wife. A trip to ER Destin ended with admittance to hospital. Diagnosed food poisoning. Three days later released but short lived in 120. Back to ER ended in emergency surgery for ruptured Gall bladder. Capri staff was our support all the way. #120 time expired and staff accommodated with a move to Capri #123. Convalescence until doctors release in #123. NO ONE on the Emerald Coast could have treated us more kindly. We will be back , healthy and fully satisfied to enjoy winter 2019-2020. We are so happy to know that you and your wife are on your way to a healthy 2019 and we look forward to seeing you both back here as our guests at the Capri soon! Thank you for taking the time to share your review of your extended stay at Capri #123 as well as the other 2 condos you enjoyed while here at the Capri. We thank you for your very kind words for our team, we really do appreciate it and we appreciate having you all as our guests. We hope you all have a wonderful Summer, Spring, & Fall, and we hope to see you again for another wonderful winter stay here with us at Capri by the Gulf in beautiful Desitn, FL! Thank you for sharing your review for Capri by the Gulf #123. We are delighted to know that you all had a great October beach vacation! We thank you for your feedback about the bed and we will look into this. We apologize for any issue with it. We hope to have you all back again soon as our guests here in beautiful Destin, FL! So pleasant to be steps away from the beach, especially with little ones! Thank you for sharing your review for Capri by the Gulf #123. We are so pleased to know that you all had such a wonderful Family Beach Vacation here at the Capri in Destin! We hope to welcome you all back again soon as our guests here on Florida's Emerald Coast! The condo was very nice and the Ladies in the office are Awesomeand very helpful . We will be back . Thank you for your review of Capri by the Gulf #123. We are happy to know that you all had such a wonderful stay and we look forward to welcoming you all back again soon as our guests here at Capri by the Gulf in Destin! Thank you for your kind words for our team, we appreciate that very much! We had a very nice, relaxing time. The condo was nicely decorated and cozy. It is literally steps to the beach , on the beachside. Everything was great. The only negative would be the mattress in the master bedroom. It is comfortable unless you lay near the edge of the bed, you feel like you are falling off. As long as you stay in the middle you are fine. That was the ONLY negative that I can think of. We will definitely rent here again , and recommend it to anyone interested in Destin. Thank you for sharing your review. We appreciate having you as our guests and we are very glad to know that you all had an incredible beach vacation stay in this newly renovated beach condo! We're sorry you didn't find the bed's edge comfortable, but we're glad that you found the center of the bed fine. We hope to welcome you all back again soon as our guests for another wonderful relaxing beach vacation stay with us here in beautiful Destin! Great place, clean, convenient, especially with small children! We will definitely stay here again! Thank you for sharing your review for Capri by the Gulf #123. We are delighted to know that you all had a wonderful stay with your family at the beach and that it worked out so well for the little ones. We would love to have you all back again soon as our guests here at the Capri in Destin! The rental was clean and comfortable. The beach was not overcrowded. The staff was very helpful if I had any questions or requests. Thank you for sharing your review for Capri by the Gulf #123. We are so happy to know that you had an awesome vacation stay in this beautiful home and that you so enjoyed the uncrowded beach here at the Capri! We hope to welcome you back again real soon for another stay with us here in beautiful Destin, FL! Came to Destin for our anniversary. We didn't book anything before we arrived. We drove around for a while. We saw Capri and thought that looks like some where we would like to say. We walked in the staff greeted us. They gave us a tour of the property. We booked Capri 123. It was very clean and recently updated. We had a wonderful time and enjoyed spending our Anniversary at Capri. And will definitely return. We would like to say thank you! To the staff for the pie and Anniversary card. Thank you for sharing your review for Capri by the Gulf #123. We are so pleased to know that you all had a wonderful Anniversary Vacation stay at the Beach! Happy Anniversary! We are delighted that you all stopped in at the Capri and we're so glad to hear that this won't be your last time staying with us! We thank you for your kind words for our team and we're so happy to know that you all appreciated our gift! We hope to welcoming you all back again soon as our guests here at the Capri in Destin, FL! Great vacation. Property staff was very friendly and helpful. Thank you for taking the time to share your review of Capri by the Gulf #123. We are so pleased to know that you all had a great vacation with us at the beach, and we're happy to hear that we were able to offer friendly helpful service to you! We would love to welcome you all back soon as our guests in beautiful Destin, FL! We had a wonderful stay. Angie and her staff treated us like family. If there was anything we needed, they were right there to take care of us. Room was very nice. Perfect for the 4 of us. The grandkids loved the bunk beds and how close we were to the beach. We are already planning a return trip next year. Thanks Harmony Beach Vacations! Thank you for sharing your review for Capri by the Gulf #123. We are so glad to know that you and your family had such a great stay with us at the beach, and that you found this beautiful home just right for your group, and that the grandkids loved the bunk beds! We thank you for your kind words for Ange and the staff and we'll be sure to pass that along to them! We highly value our wonderful guests such as yourselves, and we're thrilled to hear that you could see how much we appreciate you and your family being our guests! We look forward to having you all back again next year as our guests at the Capri in Destin! Thank you for sharing your review for Capri by the Gulf #123. We are so pleased to know that you had an enjoyable stay with us in this beautiful condo! We hope to welcome you back soon for another Beach Vacation at the Capri! Wonderfuk experience at a great price! The rental was right on the beach, great price and clean, decorated nicely, and had a full kitchen which i appreciated having. I had my kids with me and eating out while on vacation can get expensive. I was able to cook most of our meals with the fully equipped kitchen at the condo. Overall experience was amazing. I will be returning to the same condo every year! Thank you for sharing your review. We appreciate having you all as our guests at Capri by the Gulf and we're so pleased to know that you all had an amazing time! We look forward to having you all as our guests at Capri #123 next year! Our stay was for business and pleasure. It was quiet and clean. The office staff was friendly and professional. The kitchen did not have a measuring cup for liquids. The on site laundry was a great help. I would recommend Capri and would stay there again. Thank you for your kind review. We are so delighted to hear that you all had a wonderful stay with us at Capri by the Gulf #123! We hope that you were able to let our office staff know about the measuring cup so that we could get one for you. We are happy to serve our guests in any way possible. We hope to have you all back soon as our guests in beautiful Destin, FL! Had a great time. Wonderful experience. Thank you for sharing your review for Capri by the Gulf #123. We are very happy to hear that you had a wonderful experience on your beach vacation and we would love to welcome you back soon as our guest here on the Emerald Coast! Clean and comfortable accommodation, there were three of us staying and it was just big enough, I think it would be a bit of a squeeze for more people. Office staff were very friendly and helpful. Thank you for sharing your kind review. 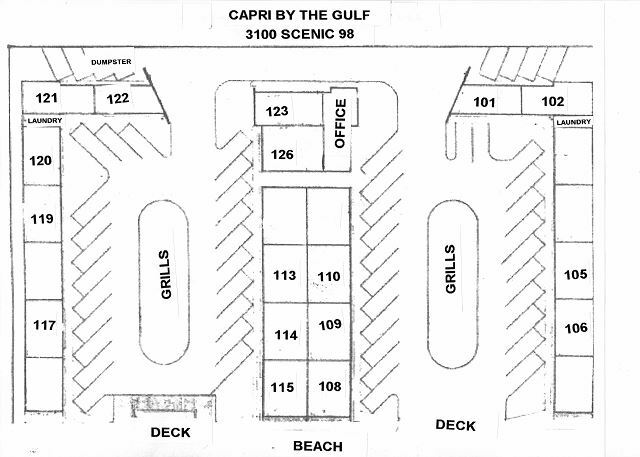 We are so pleased that you all had a pleasant stay with us at Capri by the Gulf #123, and we would love to welcome you all back soon as our guests in Destin, FL! It was a fantastic experience. My family thoroughly enjoyed the stay at Capri 123. We loved the room décor, everything was clean and it was as shown in the pictures. Thank you for sharing your review. We are delighted to have had you all as our guests at Capri by the Gulf #123 and we are so pleased that you all had a fantastic time! We would be most happy to welcome you all back soon as our guests at the Capri! Good experience overall. Layout of room not practical for my party. Bathroom in main bedroom was not convenient. Thank you very much! We are delighted to hear that you all had a good experience for your May vacation! We appreciate your feedback about the home layout, and we would be more than happy to help you select a floorplan that is more suitable to your family's needs for your next Beach Vacation! Very good, clean. Rental needs the bathroom and kitchen updated and the place should be painted. Thank you for sharing your review and suggestions. We appreciate having you stay with us and we value your feedback. We do share our guests suggestions with the homeowners as well so that they can consider our guests ideas when making updates. We are pleased that you enjoyed your stay with us and we would love to welcome you back soon as our guests at the Capri! Isn't a high rise building!!! Thank you for sharing your review. We are very pleased to hear that you enjoyed your stay with us and we welcome you back as our guests anytime! Took my son and his friend to vacation.. The enjoyed the white baby crab Hunting every night. I never had to worry about them because we were on the beach . It was safe , they never had to cross the street. We love Destin and Capri ! We have been coming to Destin now for several years. After staying in several different locations, we have found our new favorite place. We have a large family and this room was adequate all around. Everything from friendly service to helpful staff and the big bonus was having a nice private beach only for guests to use. We love this place and will be returning as soon as we can. The property was very clean the only complaint I would have would be that there was not enough dining room for a family in this particular room but however we made do and everyone was overall very happy with our stay and we will book with this particular property again in the future. I would recommend it for anyone wanting some time away in a quiet beautiful atmosphere. Nice clean property,with one of the best locations in Destin. Very satisfied with Condo and staff..
We had a very good time. This is the third time we have stayed at The Capri and will stay again. It seams to be less crowded in that area. A very friendly staff and very helpful. We were a late arrival and check is was to be after the office closed. Explained this from the very beginning. No problem getting the code for lock box while in route to obtain entrance to condo and gate(s). As shown in picture the condo has no number if entering within the gated area and map attached to web page doesn't show where 123 is located on property. It took 45 minutes of searching and with the help of a guest to located 123. My suggestion is to mark entrance to 123 within the gated area. Add a light to the unit by the door within the gated area. Mixed message regarding linens. Was told we would need to laundry but upon arrived we did have towel service. Would not have packed extra bath/wash towels. Bedding for couch was 2 mismatched sheets and one very dirty. No blanket. Because I took extra linen used my own. High Speed Internet doesn't not work after many attempted each day. We tried the fix using suggestion in condo booklet to unplug to restart. Suggestion, offer WiFi to the entire complex. Sleeps 6 but only 4 chairs for dining table. Something to think about. I would suggest mentioning guest must use stair to access beach area. One person in our party has a problem climbing stairs. When we got to the beach early enjoyed the umbrella and beach chairs provide complimentary. I would book again with Harmony and maybe the same unit. The office staff each day I went in was friendly and helpful. Liked that local brochures were in the office to help plan activities. A tip was left for housekeeping. Thank you for your review of Harmony Beach Vacations. We appreciate you letting us know what went well and how we can improve. We apologize for any miscommunications during your stay concerning linens and where your condo was located at the property. We welcome all feedback from our guests and will use your suggestions to better our service. We have changed the check in information sheet so the direction to #123 is now in bold red lettering. We have also added numbering to the side door of the condo as you suggested. I'm sorry about the blankets, we keep extra in the office. Please always let us know of any problems so we can take care of it for you as soon as possible. Thank you again for your review and great suggestions. We hope you and your family will return soon to the Emerald Coast!